The third World War is nearing. Each super power country is going through a communications war to prepare for it, a war to obtain the top profiles' information of enemy countries using the Russian's secret weapon BEAR, China's Hao Long, and the United State's Confidential Assassination Troop, a.k.a. CAT. Though, so far, C.A.T. 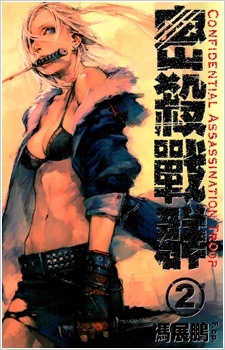 has only reached the two volume mark, and is currently on hiatus, not for too long I hope, the author has still been good enough at his craft to flesh out an interesting story filled with political intrigue, personal vendettas, and enough action to put Yuen Woo-ping's choreography to shame. The story centers around the character of Cat, an assassin whose father killed her mother and then himself when she was very young, forcing her to live with cats until she was taken by a group called the SFP project. While there she was severly abused, and after escaping is taken in by a group of assassins who train her so that she can take revenge on the three men that raped her in captivity. The is also another part of the story, in which a man named Alvas is using the abilities he gained as head of the CIA to &quot;play a game&quot; with the major nations of the world. Much of the story still isn't fully fleshed out because of the hiatus, but hopefully if, and when, it returns, the story will be completely flesh out. The art is amazingly beautful, on an almost Hiroaki Samura level. Each panel is rendered beautifully, and the sketchy style really translates well to the action scenes, much like Samura's magnum opus Blade of the Immortal. Each character looks different and is well designed and drawn with full attention to detail. I could possibly do a full term paper with praise for the art alone, provided I had enough sources to quote, so I will continue to the next subject. The characters are very interesting, each having there own motives for there actions. There is Cat, who though she is trying to kill the men who raped her, and also avoid capture from many government agencies, is beginning to realize that it would be good to have a normal life, where she could live like a human and not a monster. There are the Bears, who are crazy Russian death-row inmates who were injected with special viruses that made them stronger and unable to feel pain. There's Alvas, the man who is trying to play one last game. And then there are the rest who haven't become worth mentioning yet. I was immediately pulled into this work from the minute I started reading it. Full of action, beautiful art, and an interesting storyline, it sank it's hooks in me and didn't let go... until the end of the second volume. A wonderful piece, probably not going to win any major awards, but it doesn't need to because it stands on it's own merits alone. It's only natural to hope for something you like to be just a little bit longer, just one more volume, season or inch... I didn't expect what is essentially an action flick with "we gotta have a reason for all this to happen" type story to warrant this but towards the end it's just interesting enough for me to get excited to see what happens next and then it ends in a way that implies more is to come. Art: If I didn't know beforehand I'd be sure this is a Heroaki manga. It's realistic and detailed while also rough, sketchy and very dynamic with plenty of violence to spice things up. Characters: bare minimum is there and it doesn't get in the way cause this isn't a manga where you need deep and complex characters. There are some awkward attempts to flesh then out but those are rather nice and brief. Story: genetically modified soldiers, international spies, politics and terrorism are thrown together at random to make sense of like a teenage girl with inhuman power and cat claw blades (?) fighting a Chinese spy and three Russian super soldiers on top of a train. Near the end it gets a little more sensible and there's a lead into rogue government agent using metal gear tier technology to destroy the world and some mentions of Chinese mythology. I actually wanted to see what will happen next but too bad. Funfactor: I think this is worth reading for pretty cool action. The whole thing is just two volumes so it's not a huge time investment anyway. This piece of work has HIROAKI SAMURA stamped all over it. From the art, to the characters, to the plot...it's like BLADE OF THE IMMORTAL in a modern setting. Except it isn't by Hiroaki Samura......could have fooled me though! Plot-wise, there isn't really one...there are *hints* of an overarching plot but it isn't developed. What there is, is just a rough setting and a bunch of characters with their own agendas--but again, these aren't fleshed out (enough.) The chapters aren't standalone either, but build on each other...but there wasn't anything to motivate me to keep on reading on except to know where all this was going...and I sort of knew, that at 2 short volumes, it probably wasn't going to go anywhere (and yes, it ended prematurely and without any good resolution.) Consequently, I struggled with the last few chapters and just skimmed through. The general feeling I got from this is that it was a little boring, a little confusing, but ultimately just a waste of time. Shame, because the potential is there for it it develop into something decent, if not good. The art is the probably the best thing about this manga...it is a very good imitation of Samura's style (seriously, if I didn't know better, I would have thought Samura drew this) and since I love Samura's art, it goes without saying this would appeal to me too...no points for originality though! On the flip-side, it also suffers from the same flaws that Samura has, namely that the characters' faces look too similar and it's difficult to tell some of them apart. The sketchy, rough style also makes some of the action panels hard to interpret (too many lines everywhere.) I hope, for his own sake, that this mangaka eventually develops his own style...the drawing style here is just TOO much of a clone of Hiroaki Samura's very distinctive and recognisable style. Bottom-line: There's just not enough going here to justify the time spent to read it to its (inconclusive) conclusion.